Free play is absolutely essential to a child’s mental health—when children are involved in activities that are freely chosen and directed by them, they undergo healthy psychological development. However, children can’t play alone; they need other children to play with! By creating a community wherein free play is embraced, you not only create a safe environment for your child to explore the boundaries of free play in, you also give them friends to do it with. Hold a block party and get to know all your neighbors! Introduce them to your children, and inform them that your children will be playing outdoors more often. Let your neighbors know how to reach you if need be. Join hands with your neighbors and local officials to make your neighborhood more safe and friendly. Create an environment where all your children can play and explore the outdoors. This space could be as small as a set of adjoining backyards, or as big as an area a few blocks square! When your children are playing in the neighborhood, ensure that there is always at least one parent supervising the play. This parent should refrain from hovering over the children. They should merely keep an eye on the children, offer them water and snacks, etc. Give your child a cell phone for emergencies. Otherwise, enforce limits on electronics. Allow your child to carry a cell phone just in case they need to reach you during an emergency, but ensure that when your child is having free play, they are not glued to their screen. Adults play too! Let your children see you engaging in hobbies such as practicing guitar, working a puzzle, knitting a sweater, etc. Show your kids the importance of free play by engaging in it yourself. Speak up about the benefits of free play. 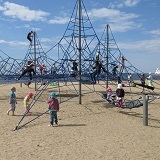 Educate your community and encourage other parents to embrace free play for their children!